This was pure splendid sweetness (but steamy and funny, AND angsty, too)! The perfect second chance romance, and now, one of my absolute favorites. But I knew that would be the case, considering how much I love this author, and I was especially excited when our book-crew was falling all over themselves to recommend it to the rest of us. I. WAS. IN!!! :D!!!! R: Ghosted, Maryse. I’m loving every single word. At the rate it’s going, it may make my top ten. A little girl whose idol is her famous dad, but she doesn’t know it? Kill me now. …BTW! OMG the way she’s doing the flashbacks is freaking fantastic. And I usually hate flashbacks! Maryse: Oh yeah… Ghosted sounds PERFECT for me, too. I gotta. I just GOTTA! Amy: Dang…y’all are killin’ me with Ghosted!!! Jean: I AM NOT SORRY THAT I STARTED GHOSTED RIGHT NOW……SOOOO GOOD!!!!! Do it Amy…. *i am the voice inside your head while you are running*!!!! Maryse: I’m reading Ghosted and have been hooked since the very start. LOVING!!!!!!!!!!! 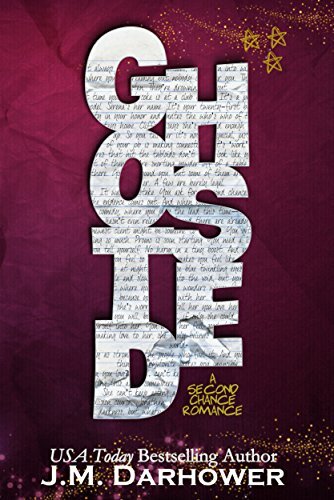 Melinda: I finished reading Ghosted and loved it. Maryse: Oh I have GOOD reading days ahead of me, then, Amy. I’m 50% into Ghosted (it’s a long one) but still VERY happy to be indulging myself. Kelly: I just finished the book! Loved it! Tessa: Ghosted by JM Darhower – That’s how you do sweet contemporary. With a ton of realism and heart. …JM Darhower is just a brilliant writer. OMG EXACTLY, TESSA!!!! That is how I felt. It’s sweet, but it’s real, and at times, it’s raw. It’s my perfect romance read. And R!! YES!!!! The flashbacks, so cleverly written… kind of genius in fact, that I was AS INTO the whole buildup, as I was into the present. And yes, as I mentioned, it’s a slightly longer book, but all the more for us to indulge in. R: I had NO idea Ghosted was so long! I read it sooooo fast. I saw that in a review today and looked it up and yep, long! It could have been double and I wouldn’t have noticed. There’s no rushing through a single detail, and yet, it’s not heavy with it, either. It flows, it’s real, it’s emotional (in all of the best ways), and the characters are 100% true to themselves throughout the entire story. I could see these people perfectly (yes, people!! They were THAT real – these are not just characters to me, they ARE people), from their adorable tiny daughter (gah!!!!!! MY HEART!!!) to his goofy-grumpy “sponsor” to her super-protective father. Okay before you forge ahead to the rest of the review… I would request you skip the next section, because, while it’s pretty obvious from the blurb what it’s about, and I don’t really give anything away, I say go in blind as of now (or just read the blurb and nothing more). Because it’s HOW the author unravels their entire story for us, that makes this book SO special. Well, at least, one of the things that makes it so special. ;)) ‘Kay? You don’t know this, but that girl? She cries the entire way home from school. She isn’t crying because she got in trouble. It isn’t out of guilt or shame. Her tears have nothing to do with herself. She cries for you, because of the look she saw on your face when you walked away. There’s anger in your eyes again and tension in your jaw, and now she knows what that means. Because of course, as Jonathan begins making his way into Hollywood, and Kennedy continues working menial jobs to support them, the stress kicks in, and feelings of abandonment and rejections rear their ugly heads. And with good reason. The call of Hollywood is great, and the pressures, even greater. The two aren’t seeing eye-to-eye anymore, and of course the elite of the industry are forcing him to make choices. So many of them… bad. I feel like an obsessed, lovesick fangirl, convinced the heartthrob was supposed to be mine, but he wasn’t. and Kennedy’s been raising their very young daughter on her own (and working in a grocery store as an assistant manager the entire time). And here I am— somebody, all right. Assistant Manager Somebody at Piggly Q Grocery in a ‘blink and miss it’ kind of town in upstate New York. Thirteen dollars an hour, forty-plus hours a week, with a full benefits package including (unpaid) vacation days. Not that I’m ungrateful. I’m doing better than a lot of people. My rent is paid every month. My electricity hasn’t been cut off. I’ve even got overpriced cable! But deep inside, I know this isn’t the kind of greatness my parents envisioned for me. “Breezeo,” she says again, a little louder this time, gone from my side in a blink. Running. Jonathan stands there, blinking down at her, confusion clouding his face. And I’ll let you devour it from there. 😀 *waggles eyebrows* Trust me!!! YOU. WILL. LOVE IT!!!!!!!!! Maryse your review is spot on!! Loved Ghosted!!! Hands down 5 stars!! This sounds right up my alley, Im one clicking! *starts doing happy dance* There wasn’t a point where I wasn’t in love with it. She’s gonna LOVE it, won’t she, Tessa? :D!!! Best part was the little girl Madison. She was adorable! You know what would be cool? If I could clone myself so I could read a bunch of books at once. There simply is NOT ENOUGH TIME to everything. Agreed. I have three I want to read right now. Wrecked (Jeanniene Colette), #2 of the Something in the Way trilogy, and a psych-thriller I just downloaded from Kindle First. I’ve started doing that. I’m reading 3 right now! Just finished Ghosted this morning. It’s everything you said in your review Maryse. Just loved everything about it, well except would have liked a longer epilogue!! Just a tiny nit-pick, Jonathan and Kennedy met at a private high school, not college. I’m reading Wild, Evelyn Hugo, and The Man I Thought You Were. I’ll read until one slows down and then switch books. If one is a breakthrough winner like Ghosted, I’ll drop the others, but that hasn’t happened with these three yet. Everyone who reads Ghosted will love it! Leslie, read Ghosted. It was good enough to make Robin and I agree on favorite book of the month, and we definitely have different taste. Yes, Leslie. Tessa speaks the truth. I only cried because it ended. excited to have a Maryse 5 star book to read!!!! I saw this and was debating on getting it. After seeing your 5 stars will be getting now. I love when you say you know I will love it Maryse because that means I DEFINITELY will! I’m on it!!!! Starting now and all else put on the back burner. Excited!!! I feel a late night ahead! Great review Maryse! We need more like this one!